Our RMC website has been reporting on Software Development for years. Recently, I completely updated the website – new design and new content. I have a few features left to ad, but most recently I added a free membership system which allows access to restricted content including tutorials with full source code and HD Video screencasts. Editors Note: RMC is independent and is not an affiliate member or reseller to these plugins. The links are provided for your convenience. 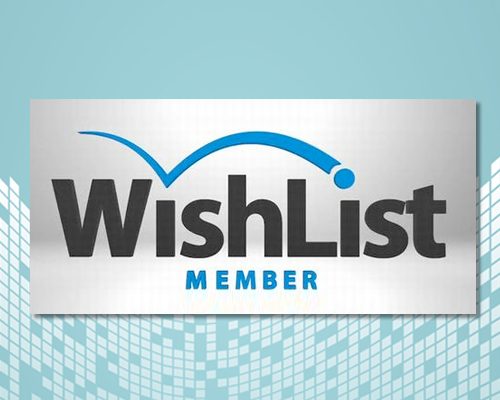 Updated: I have installed Wishlist Member on a new site and created a robust tutorial complete with HD Screencast Videos. Check it out! Why Add Membership To Your Site? Typically sites add membership to restrict content. They may set up a membership wall between non-members and the content that only logged-in members can see. Membership (at least one level of membership) is often offered for free. Capturing the sign-up information of new members allows sites to send newsletters and target content more effectively based on the type of member. To monetize the site they may setup a pay wall allowing certain content only to those paying members. In a complex, but fairly standard implementation a site may treat non-members, free-members, and paying-members uniquely. This allows the site to attract newbies, build a relationship, and make money. In my specific case, I want to target newsletters to my audience. I hope the newsletter will encourage one-time visitors who arrive to read an interesting link to become regularly visitors who check back to read new content regularly. I could just add a newsletter widget where users input their email and click ‘Sign Up For Newsletter’. However I thought tying a newsletter into membership would a) ‘bother’ my audience the same amount yet b) offer much more compelling reasons to sign-up (via membership wall). As a WordPress-based website, I researched for compatible plugins to offer easy membership. There are free plugin options too including Member Access, Members, User Access Manager, & WP Member. Editors Note: None of the free options above appeared to offer a compelling list of features. Especially considering that you can monetize your site more easily the relatively small cost of the pay plugins is well worth it. Here are some common features you want in a Membership plugin. Wishlist member, which I ultimate chose has all of these, however RMC currently needs very few features. I still wanted a plugin that could grow with my site. I’ll add new features with time. Flexible Membership Options (Yes) – Create Free, Trial, or Paid membership levels — or any combination of the three. Protect Text (Yes) – Wrap text within a public posts in a [private][/private] tag. Non-members cannot see it. Custom Sign-Up/Registration Pages (Yes) – Control and customize the experience for non-members to become members. After evaluating the options available and my current (and future) needs for membership. I chose the Wishlist Member (WLM) plugin. It appeared to have a solid, updated website, good feature-set (only a partial list is above) and good customer support. The installation is crazy-simple. You purchase through the website. Within 5 minutes you can download a zip and use the WP Plugins dashboard to ‘add new plugin’ and start the setup. 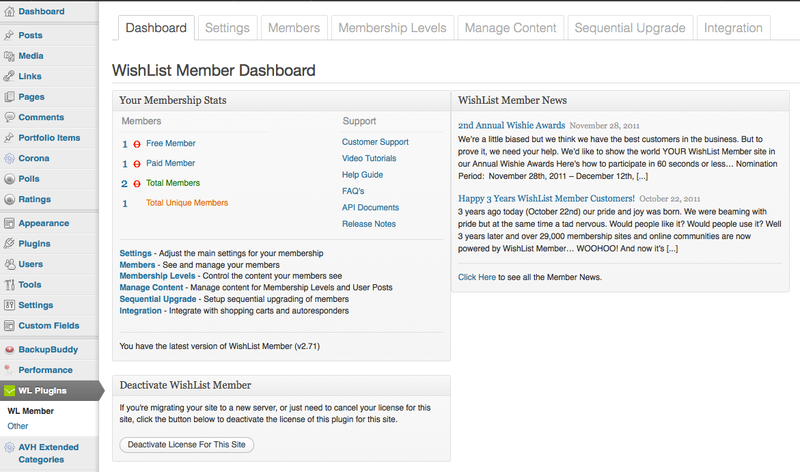 The WLM dashboard sites within the WP dashboard. It features 3-tiered navigation and has all the options you could want. The design is pretty, (fairly) well-thought out and easy to read. There is a ‘Setup Wizard’ that walks you through protecting your site. One of the challenges with this, is that if you are new to membership concepts, you may not KNOW what you really want to protect. However there are helpful “?” buttons within the entire WLM dashboard experience that can answer questions regarding terminology and concepts. There is a wealth of documentation. Its a bit challenging to see exactly where to start – the plugin does many things you may not need or care to read about. To help figure out exactly WHAT you can do with WLM I recommend starting with the showcase of WLM sites. The provided WLM video tutorials are helpful (if a bit outdated). Just about everything you want to do is covered there. Great job WLM! The WLM forums accept community questions and community answers. Often companies have official respondents to answer popular posts. In my short research for a few key questions, I found poignant posts which seemed to reflect relevant and common doubts from users without any answers. Now that the site is setup and running, there is not maintenance needed. As I add new posts, I will decided if all or part of the post should be protected. Adding this protection is fast, easy, and dependable. During the setup process I created a list of suggestions for WLM. After log-in I’d like to direct the user to the page they were reading BEFORE they had to log in. Should be possible. It’d be really great to use this in more places (after registration confirmation too). Throughout the dashboard, there are already “?” buttons with tooltip text floating in a box. That is great. I recommend to add “more” buttons which link to relevant help pages on the WLM site, and video buttons with tutorial videos showing in lightbox (floating over admin). There are tons of great video content and having them integrated into the admin would save valuable time and encourage users to learn more. Unusually, anytime after the initial ‘Setup Wizard’ is complete. Maybe it would be useful? Well to my surprise it shows red “[INCOMPLETE]” for steps I know I completed. I think my original work was saved and is in proper use on the site, but this section is a bit broken upon quick opinion. Editors Note: All of these suggestions have been sent to Wishlist Member via the customer support (Ticket #71865). At the time of this article, no response from customer support has been recieved, although none is really needed or expected. While I took time to compare features from the various plugins (and WLM is favorable), I did not install and try other competitive plugins. Overall WLM is a solid plugin. It promises great features and ease-of-use and it performs as advertised. The forums and email support did not wow me. However I’m spoiled by really active, vocal communities in my non-Wordpress software development experience (Flash/Flex/HTML5), so perhaps my expectations are too high. I did find a few WLM forum-posters who are *really* helpful with patient, concise help. Kudos to good people. Checkout the Wishlist Member website for more information. To review Wishlist Member, I added it to RivelloMultimediaConsulting.com See this post (and many, many more) for an example of the non-member experience. Then sign-up real quick to see the member experience. Its nice!